My family thinks I'm a little bit nuts, but I KNOW this stuff works. 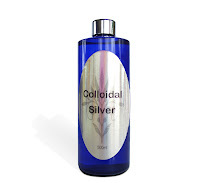 I stumbled across Colloidal silver a few years ago on the internet. I saw some at my local health food shop and bought a bottle. I started having a small mouthful each day, swishing it around my mouth for a while before swallowing it. I also tried spraying it on my eczema and in my hair - It didn't seem to make a difference for the eczema but made my hair fabulously soft. I'm sure that taking it regularly helps the body's immune system and helps fight off colds and flu. After taking it for about 3 years, my bottle ran out and I didn't replace it. I guess I thought, "Is this really doing anything?" Within a month I caught a horrible 'flu, then a couple of weeks after that a cold that turned into bronchitis and then a few weeks later I had my super huge flare which led to my diagnosis of Crohn's disease. Needless to say, I've replaced my bottle of Colloidal Silver and won't be letting it run out ever again! Silver has been known as a bactericide for over a thousand years. A colloid is quite simply a sub microscopic particle of one substance suspended in a different substance (the medium). In Colloidal Silver, the particles are called silver ions which have a double positive charge, and so mutually repel. (One of the reasons they remain in suspension), and the medium is pure or de-ionized water. Even in ancient times it was known to prevent disease and was commonly thought that disease could not be transferred from one person to another if by drinking from a silver cup. Tableware today is still called “silverware”, even though it is commonly made from stainless steel. Silver coins were dropped into milk to prevent spoilage and silver containers were used to store foods in general. Until almost 1970, it was common for scientists to sterilize petrii dishes by placing a silver coin in them and silver was long used for plates for the surgical repair of bones. The most common usage of silver was by members of royal families, who ate from silver plates, drank from silver cups and used silver utensils almost exclusively. Over a period of time, silver was slightly worn off and mixed into their food and drink. Commoners, who ate from earthen ware jugs and bowls were frequently ill.
Royalty were called “blue bloods” because their blood had a slight bluish tint, due to the minute traces of pure, metallic silver. This condition is known as Argyria. Today Agyria is rare, perhaps non-existent, but results in the cosmetic appearance of grey skin. However if using properly produced colloidal silver, there appears to be no danger of this happening in today’s world. One of the most complete historical references on Colloidal Silver was published in “The Lancet” dated Dec. 12th, 1914. From the 1920’s through to the 1940’s, silver was ground into a very fine powder and added to water. It was a common occurrence for adults to take 1-2 tablespoons (equivalent of approx. 20 mls by today’s standards) of Colloidal Silver on rising. (Children would take 1-2 teaspoons or the equivalent of 10 mls). The liquid would then be held in the mouth, under the tongue for 30 seconds, before being swallowed. A form of healing crisis sometimes occurred after two days, where the body sloughed off the build up of toxins. This caused minor incidences of flu-like symptoms as well as mild diarrhoea. The remedy was to increase consumption of water and to rest as this would lessen the symptoms. After a week, many people reported feeling better than ever! The equivalent of these dosages is still being used by thousands of people today! Up to 1938, bacteria were considered treatable with Colloidal Silver. Unfortunately, with the development of patented antibiotics, silver was almost all but forgotten. Antibiotics are only effective against bacteria, not fungi, viruses, or yeast. The introduction of penicillin almost certainly caused the research into Colloidal Silver to be put aside. Penicillin was less costly, more profitable and able to be industry controlled, unlike Colloidal Silver. Because pharmaceuticals can be patented and Colloidal Silver cannot, pharmaceutical companies find it financially worth while to educate doctors on their products. People have used natural methods of fasting, colon cleansing and herbs for thousands of years to keep themselves healthy.